Steam shot up to 140 g/min, even vertically - perfect for removing creases in curtains and garments. Ideal combination of 2300 W power output and steam emission for a great end result. The TexStyle 3 steam iron makes your ironing more gentle and easy, even when ironing backwards. 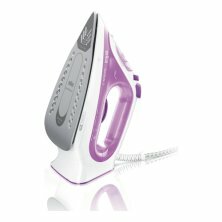 The triangular shaped precision zone at the tip of the iron allows you to easily remove the toughest wrinkles from hard to reach areas like collars and seams.